Visualize finding the most central and broadly popular candidate. Twelve voters spread out along an issue. B is nearest three, and C is nearest five. Three candidates mount their podiums. A voter naturally prefers the candidate who's political positions are closest to the voter's. Voter 1 on the left likes candidate A best. Answers: Mouse over a question, but do not click. Does anyone win a majority? Yes, No. Candidate C wins the runoff. Candidate A loses this one-on-one test. Candidate B wins by eight votes to four. Candidate B wins her next one-on-one test also. She can win large majorities against either of her rivals. So she is the one who could best represent these voters. She is the Condorcet winner. nearest three, and C is nearest four voters. Candidate A lost the previous election under plurality rule. But let's say her party was able to gerrymander the boundaries of her voting district. By adding a neighbor who tends to vote for her party and dropping a less favorable neighbor, she can win the district. A big shift in policies might follow. Candidate B still passes every pairwise test so she would still win under the Condorcet rule. B is nearest three, and C is nearest five voters. Two issue dimensions: One dimension may not be enough to show political opinions. No matter. Voting systems work the same if voters are concerned with issues that do not fit neatly along the left-right dimension. The picture at left looks at a group of people spread out on two issue dimensions: left to right and up and down, perhaps on the steps of their school or state capitol. It as though we asked them a second question about a political issue unrelated to taxes and services. "Please take one step up if you want more regulation of reproduction. Take two steps down if you want much less regulation of reproduction, and so on." The voting systems show their characteristic patterns even if the voters are somewhat polarized into two groups with B getting only one or two first-choice votes. 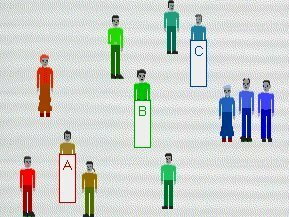 PoliticalSim lets you play with many voting systems -- and by playing, learn patterns that tend to result from each rule. You may download PoliticalSim. Three issue dimensions: To get such a well-balanced constellation of winners requires a multi-winner district and an ensemble rule: The chairperson (C in this picture) is elected by a Condorcet rule while the other reps are elected by proportional representation. The ballot-design page showed how preference ballots let voters rank the candidates as first choice, second choice, and so on. The tally-table page tells how ballots are tallied and candidates are compared. But voters don't need to do the counting. For most people, it is enough to know that Condorcet's rule finds the one candidate who can win a majority over any other one. The Instant Runoff page explains a rival method to elect a single winner. The page on voting strategies tells how voters and politicians can manipulate plurality rules and why Condorcet’s rule resists most schemes. The page on voting districts graphically shows how easily politicians create districts that predetermine election results. The pictures above have shown how Condorcet's rule minimizes the effects of such gerrymanders.